Zaha Hadid designed multi-use-inspired vase Melbourne Tower Archi-new - Free Dwg file Blocks Cad autocad architecture. Archi-new 3D Dwg - Free Dwg file Blocks Cad autocad architecture. A typically unique Zaha Hadid tower could be built in Melbourne after Australian developer Landream submitted a planning application for the mixed-use project. 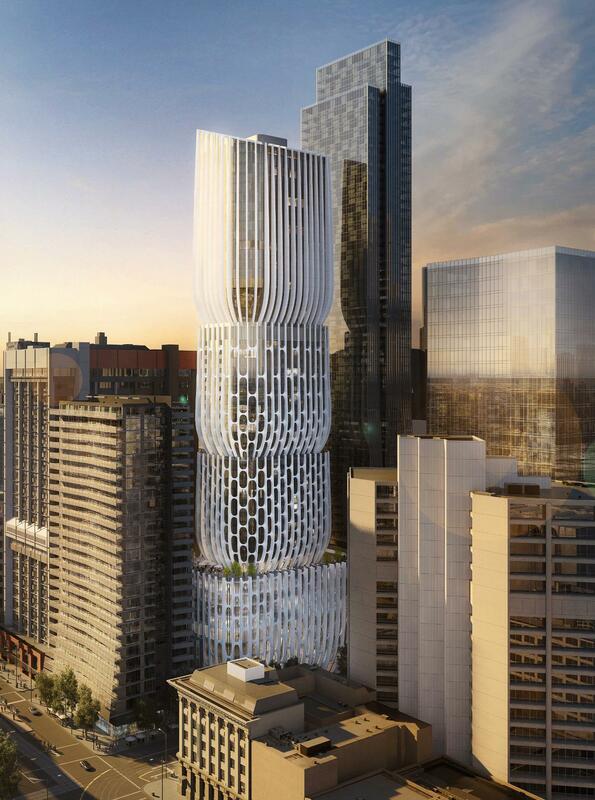 The 57-storey tower, which would be located at 582-606 Collins Street, has been designed as a series of four stacked vase-inspired volumes, with a sculptural, mesh-like façade. The elements are intended to reinterpret the area’s architectural heritage with the futuristic flourish Zaha Hadid Architects are famous for. The architecture have developed the design in collaboration with local firm Plus Architecture. While full details of the building’s leisure aspects have yet to be revealed, it has been confirmed that retail units and communal space have been included in the proposed structure to promote public engagement. Open public spaces will feature at the base of every tapered volume in the tower and an external plaza on the ground will be accessible 24 hours per day, linking to a new neighbourhood pedestrian and cycle route. Landream said the structure has been designed to use 50 per cent less energy than a conventional mixed-use tower as the unorthodox façade contributes to a reduction in the direct solar gain of the building. “A high performance glazing system, high efficiency central cooling, high efficiency lighting and grey-water reuse systems are proposed to reduce consumption of resources and further lower the emissions,” the developer added. Zaha Hadid Architects have designed a number of other high-profile projects in Australia, including two towers for Sydney’s Mariner’s Cove – which include a boutique hotel – and Grace on Coronation, a tower development and riverside park in Brisbane. If planning is granted for the Collins Street tower it will become the latest in a series of visually arrested high-rise developments in Melbourne. Work is currently underway on the Premier Tower; a 226m (741ft) high structure featuring a series of curves. The architect of the development, Elenberg Fraser, has said his design is inspired by the music video for the Beyoncé’s song ‘Ghost’.